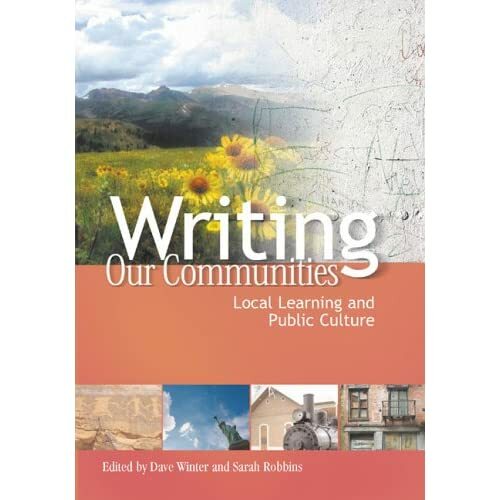 Writing Our Communities: Local Learning And Public Culture works as a great handbook for brainstorming ideas for projects that engage students in the study of your local community. Formatted mostly as a series of unit plans, the book is a quick read. Each chapter is written by a teacher from a different school. I see great value in this book as a product of a curriculum development project between the National Endowment for the Humanities and the National Writing Project. This book, without making any arguments, promotes learning in the field, whether that be with field trips, etc or by bringing artifacts in for further reflection. Research on culture of a community engages students as citizens and also helps prompt discussion as to what community means even inside the walls of a classroom. Active engagement with the community creates a sense of citizenship by showing that everything belongs in a place and with an appreciation. And these are values that we expect within our own classroom communities — creating senses of belonging and appreciation are what can be used to show better respect for the dialogue about tough topics later in the curriculum or for the resources in the classroom. My biggest take-away for the book, will be two units presented by elementary school teachers. The “Making the Classroom Our Place” unit by Leslie M. Walker, uses a children’s book, My Place by Nadia Wheatley, as a mentor text in order to show how you can go about documenting what makes a community. Her students then construct their own meaning by creating a classroom bulletin board for artifacts they write about. I look forward to adapting this activity and even the text as a wholesome activity that I can facilitate in the first few days of my own class. “Giving Students a Penny for Their Thoughts” by Oreather J. Bostick-Morgan presents to readers a great idea for an entry event — handing out pennies to students and then asking students to conduct interviews with family, neighbors, etc on what was happening that year. This activity sounds like a great way for students to engage in a low-stakes field research activity, and one that can be used to build an appreciation for history or use as early scaffolding for later research on controversial issues. My main critique of the book, however, is that it could use formatting or labels to incite more inquiry from the reader. The theme labels used by the editors coincide with how culture/community forms — reclaiming displaced heritages; educating for citizenship; cultivating homelands; building cities; shifting landscapes, converging peoples — would have deeper meaning if driving/essential questions were written for them as well, showing how the teacher went about presenting those themes to students. There is a good sampling of unit ideas that can be applied in urban, rural or suburban communities, so don’t be afraid that it will not apply to your part of the U.S. (thought all projects actually took place in Georgia). Also, documentary research or journalistic style are themes of the book while not being overtly discussed. A chapter spent on of how to scaffold students’ field research would certainly help initiate the reader into brainstorming his/her ideas while reading the afterword. I recommend the book to any teacher looking to build more relevance into their social studies curriculum or any language arts teacher looking for ways to engage students in literacy tasks that involve their community. The book lists many great ways to make learning more authentic through constructivism. Check out the NCTE website for a preview of the first chapter if interested in finding out more. Good idea, Dave, and one that I acted on just now. Maybe they will be able to suggest other texts (if they like what I have to say! ).